I’ve documented my love affair with the Utica Boilermaker extensively in these pages. I’ve written about my 2010, 2011, 2012, 2013, and 2014 runs in various posts, devoted entire posts to my participation in 2015, and 2016‘s races, and even written the locally viral 15(K) Reasons to Love the Utica Boilermaker to celebrate my favorite road race. Usually, I run the 9.3 miles with a smile on my face, high-fiving little kids, exchanging banter with spectators and fellow runners, and profusely thanking the first responders all the way round the course. But don’t let the photo — taken before this year’s run — fool you. For me, the 2017 Boilermaker run was all business. Rather than settling down after my crazy spring, my life took yet another unexpected turn. About a week after the Flower City Half, I found that my stress levels had increased to the point that my type 2 diabetes was flaring up. The strange thing, to me, is that I haven’t been feeling bad. When I first got diagnosed ten years ago, I was dealing with high blood pressure and extreme fatigue. That’s not even close to being the case now. I’m feeling great — heck, I’m running better than any time over the last 18 months, my time at the Flower City Half notwithstanding. At Tessa’s prompting, I saw doctor, and as I feared, I was put back on medication. The doctor immediately prescribed an aggressive dose of metformin to bring my blood sugar levels down rapidly, despite my insistence that my levels would go down on their own once my life got back to something like normal. A couple of days after going on the meds, I went out on my runs as usual, but my body chemistry was completely out of whack. Some days, I felt great. Others, I was tired and sluggish. I had to deal with bouts of nausea and repeated belching, something which rarely, if ever, happens to me, running or no. And when I was not running (thankfully), I had diarrhea and more wild fluctuations in my energy levels. This made Boilermaker training a little like a science experiment. No matter how I fueled and hydrated, my runs remained stubbornly unpredictable. It was hard to know what I was truly capable of. The morning of the race, Tessa dropped me off near the start line, and on the walk to my corral, I felt so anxious that I almost made up my mind that this was going to be my last ever Boilermaker. Thankfully, the thought was quickly overwhelmed by the adrenaline rush flowing from the crush of runners heading for the start line. I went though my prerace stretches, downed a gel, emptied my mind and took my place in the Culver Avenue chute. I figured if I could nail the first two miles under 18 minutes, I was in with a chance of breaking 80 minutes, which had been my goal ever since crossing the Flower City finish line. But I knew it was going to take me everything I had — mind, body, and spirit — to do that. I started up Culver feeling OK — not great, but nothing like the start to Flower City — but I hit my first two mile splits at around an 8:55 pace. I was focused solely on myself, barely conscious of the large crowd by the MVCC entrance and lining the The Parkway. I hit the 5K split right on schedule at a little over 27 minutes. As always, I ascended the Golf Course Hill steadily before opening up my stride for a fast descent back onto the spectator-lined Parkway. Once again, the crowds there were just a blur to me, and I stayed in the middle of the road, not wanting to interact with anyone and get distracted. It wasn’t until I reached the 10K split that I first let down my guard. I had started to speed up, hitting 54:27 for an 8:45 pace, so I high-fived some of the firemen there in celebration. But by the time I rounded the Champlin Avenue corner, it was back to business. Once again, I tuned out the crowds outside Utica College and St. Luke’s Hospital and tuned into myself for maximum effort (though, I confess, I did jump for a high-five from the Stilt Guy halfway down the hill for good luck). I was just 24 seconds off my goal time. At 80:24, I had run my second fastest Boilermaker ever, and had made another huge stride toward erasing the memory of 2016. And if that isn’t worth a beer or three, I thought to myself outside my usual haunt at the Polish Center at the postrace party, then I don’t know what is. 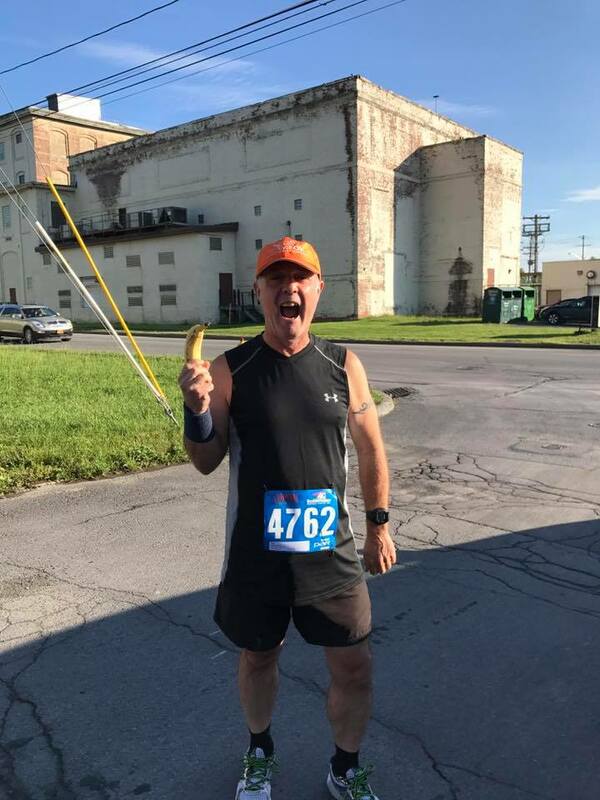 This entry was posted in The Flat-Footed Fox and tagged Flower City Half Marathon (Rochester), Type II diabetes, Utica Boilermaker. Bookmark the permalink. Well done. Just goes to show… I don’t know what. The body betrays AND responds. But still the will is supreme. Now training (I use the word loosely) for the Cow Harbor 10k Sept. 16. It’s been four years. Usually in 53-54 min. range. One killer hill. I don’t know. Maybe I’ll treat myself to a rocking chair afterwards. Wonderful to hear from you as always. And way to go! I’m sure you’ll surprise yourself, too. Now it’s time for me to prepare for the New York City Marathon on November 5. I cannot wait — this is going to be the run of a lifetime! Watch this space for training updates, and feel free to pass on any advice for the big day. “The will is supreme.” I think that just became my new long-run mantra!